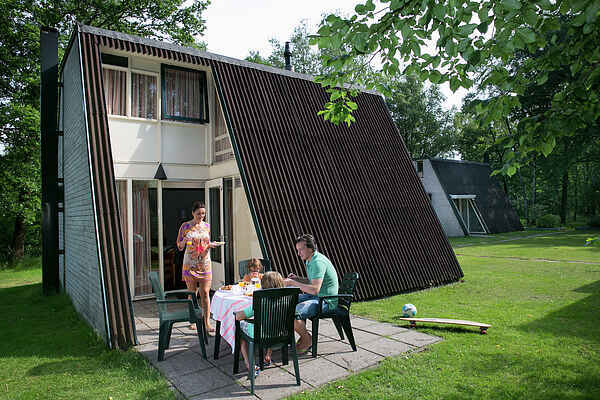 At bungalow park Hoenderloo you will find four types of bungalows and villas. There are two variations of 4 person bungalow: a nicely furnished version NL-7351-02) and a modernised version with DVD player (NL-7351-05). Both four person bungalows have a charming open fireplace. There are also two variants of 6 person villa. These are uniquely designed and have a dishwasher, microwave and one bedroom on the ground floor. There is a standard type (NL-7351-03) and the luxury type with infraredsauna for 2 persons (NL-7351-06). The latter are on the edge of the forest. All accommodations have an unenclosed garden with terrace and garden furniture.